The 2014 Winter Olympics, officially called the XXII Olympic Winter Games (French: Les XXIIes Jeux olympiques d'hiver) (Russian: XXII Олимпийские зимние игры, tr. XXII Olimpiyskiye zimniye igry) and commonly known as Sochi 2014, was an international winter multi-sport event that was held from 7 to 23 February 2014 in Sochi, Krasnodar Krai, Russia, with opening rounds in certain events held on the eve of the opening ceremony, 6 February 2014. Both the Olympics and 2014 Winter Paralympics were organized by the Sochi Organizing Committee (SOOC). Sochi was selected as the host city in July 2007, during the 119th IOC Session held in Guatemala City. It was the first Olympics to be held in a CIS state since the breakup of the Soviet Union in 1991. The Soviet Union was previously the host nation for the 1980 Summer Olympics in Moscow. These were the first Olympic Games under the International Olympic Committee (IOC) presidency of Thomas Bach. 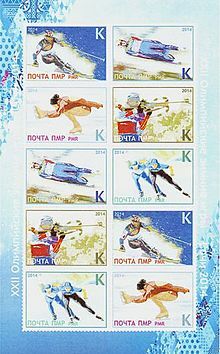 A record 98 events in fifteen winter sport disciplines were held during the Games. A number of new competitions—a total of twelve accounting for gender—were held during the Games, including biathlon mixed relay, women's ski jumping, mixed-team figure skating, mixed-team luge, half-pipe skiing, ski and snowboard slopestyle, and snowboard parallel slalom. 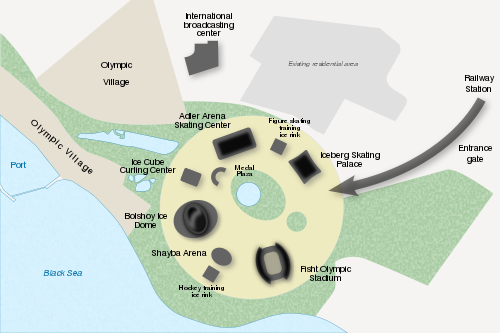 The events were held around two clusters of new venues: an Olympic Park constructed in Sochi's Imeretinsky Valley on the coast of the Black Sea, with Fisht Olympic Stadium, and the Games' indoor venues located within walking distance, and snow events in the resort settlement of Krasnaya Polyana. The 2014 Winter Olympics were the most expensive Games in the history of the Olympics. While originally budgeted at US$12 billion, major cost overruns, alleged to have been the result of corruption, caused this figure to expand to US$51 billion, more than three times the cost of the 2012 London Olympics and even surpassing the estimated $44 billion cost of the 2008 Summer Olympics in Beijing. The 2014 Games achieved a record broadcast audience of 2.1 billion people worldwide. In 2016, an independent report commissioned by the World Anti-Doping Agency confirmed allegations that the Russian Olympic team had been involved in a state-sponsored doping program, active from at least late-2011 through August 2015. The program was active during the Winter Olympics in Sochi, and athletes had benefited from the cover-up. The IOC stripped thirteen medals from Russian athletes in 2017, but nine were reinstated by the Court of Arbitration for Sport. In December 2017, the IOC voted to suspend the Russian Olympic Committee, with an option for whitelisted athletes to compete independently during the 2018 Winter Olympics. As of October 2013, the estimated combined cost of the 2014 Winter Olympics had topped US$51 billion. This amount included the cost for Olympic games themselves and cost of Sochi infrastructural projects (roads, railroads, power plants). This total is over four times the initial budget of $12 billion (compared to the $8 billion spent for the 2010 Winter Olympics in Vancouver), and made the Sochi games the most expensive Olympics in history, exceeding the estimated $44 billion cost of the 2008 Summer Olympics in Beijing, which hosted 3 times as many events. Dmitry Kozak was the main overseer for the events in Sochi. In its final budget published in June 2014, Olimpstroy—the state corporation that oversaw the Sochi Olympics development—reported the total allocated funds for the 2014 Sochi Winter Olympics of 1,524 billion rubles (US$49.5 billion). However, only about a fifth of that budget ($10.8 billion) was directly related to the Olympic games, while the rest went into urban and regional regeneration and the conversion of the Sochi region into an all-year round sea and alpine resort. The breakdown table below is based on a report that has analyzed the distribution of Olimpstroy's $49.5 billion budget. Estimates also suggest that additional unrecoverable operational costs (including for security) could have added another $3 billion. 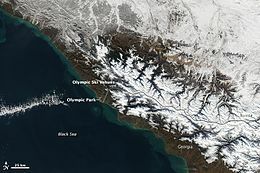 With an average February temperature of 8.3 °C (42.8 °F) and a humid subtropical climate, Sochi is the warmest city to host a Winter Olympic Games. Sochi 2014 is the 12th straight Olympics to outlaw smoking; all Sochi venues, Olympic Park bars and restaurants and public areas were smoke-free during the Games. It is also the first time that an Olympic Park has been built for hosting winter games. A new ice hockey team in the Kontinental Hockey League, HC Sochi Leopards, now plays in Bolshoy Arena. A record 88 nations qualified to compete, which beat the previous record of 82 set at the previous Winter Olympics in Vancouver. The number of athletes who qualified per country is listed in the table below (number of athletes shown in parentheses). Seven nations made their Winter Olympics debut: Dominica, Malta, Paraguay, Timor-Leste, Togo, Tonga, and Zimbabwe. Kristina Krone qualified to compete in her second consecutive games for Puerto Rico, but the island's Olympic Committee once again chose not to send her to compete. Similarly, South Africa decided not to send alpine skier Sive Speelman to Sochi. Algeria also did not enter its only qualified athlete, Mehdi-Selim Khelifi. India's athletes originally competed as Independent Olympic Participants and marched under the Olympic flag during the opening ceremony, as India was originally suspended in December 2012 over the election process of the Indian Olympic Association. On 11 February, the Indian Olympic Association was reinstated and India's athletes were allowed the option to compete under their own flag from that time onward. Although Shiva Keshavan competed as an Independent athlete and is recorded as such, he was permitted to walk under the flag of India at the Closing Ceremony. NOCs that participated in 2010, but not in 2014. NOCs that participated in 2014, but not in 2010. The 2014 Winter Olympics featured 98 events over 15 disciplines in 7 sports. A total of twelve new events were contested, making it the largest Winter Olympics to date. On 6 April 2011, the IOC accepted a number of events that were submitted by their respective sports federations to be considered for inclusion into the official program of these Olympic Games. The events included a Figure skating team event, Women's ski jumping, Mixed relay biathlon, Ski half-pipe, and Team relay luge. Team alpine skiing was also presented as a candidate for inclusion in the Olympic program but the Executive board of the IOC rejected this proposal. The International Ski Federation persisted with the nomination and this was considered. There were reports of bandy possibly being added to the sports program, but the IOC rejected this request. Subsequently, the international governing body, Federation of International Bandy, decided that Irkutsk and Shelekhov in Russia would host the 2014 Bandy World Championship just before the Olympics. On 28 November 2006, the Executive Board of the IOC decided not to include Ski mountaineering, Ski-orienteering, or Winter triathlon in the review process of the program. a Legkov and Vylegzhanin were initially disqualified by the IOC for doping offences in November 2017, and their 2014 Olympic medals were stripped (gold and silver respectively). However, their results were restored on 1 February 2018 following a successful appeal. Former professional speed skater and current deputy of the Russian State Duma Svetlana Zhurova has stated that the 2014 Sochi Olympics were Vladimir Putin's personal project to showcase Russia to the world. A variety of concerns over the Games, or Russia's hosting of the Games, had been expressed by various entities. Concerns were shown over Russia's policies surrounding the LGBT community, including the government's denial of a proposed Pride House for the Games on moral grounds, and a federal law passed in June 2013 which criminalized the distribution of "propaganda of non-traditional sexual relationships" among minors. Severe cost overruns made the 2014 Winter Olympics the most expensive Olympics in history; with Russian politician Boris Nemtsov citing allegations of corruption among government officials, and Allison Stewart of the Saïd Business School at Oxford citing tight relationships between the government and construction firms. U.S. broadcaster NBC largely avoided broadcasting material critical of Russia, although several segments deemed "overly friendly to Russia" were criticized by some commentators. However, following the closing ceremony, commentators evaluated the Games to have been successful overall. Following the Games, reports began to emerge that the Russian Olympic team had participated in a state-run doping program, which supplied their athletes with performance-enhancing drugs. These allegations first emerged in a December 2014 documentary by German public broadcaster ARD, and were detailed further in a May 2016 report by The New York Times—which published allegations by Dr. Grigory Rodchenkov, the former director of Russia's anti-doping laboratory. Rodchenkov alleged that a conspiracy of corrupt anti-doping officials, FSB intelligence agents, and compliant Russian athletes used banned substances to gain an unfair advantage during the Games. Rodchenkov stated that the FSB tampered with over 100 urine samples as part of a cover-up, and that at least fifteen of the Russian medals won in Sochi were the result of doping. The World Anti-Doping Agency (WADA) commissioned an independent report by Richard McLaren, which corroborated claims that Russian authorities had been discreetly swapping out urine samples that tested positive for performance-enhancing substances. The report concluded that the program had been operating from "at least late 2011 to August 2015", and had covered up 643 positive samples across Olympic and non-Olympic sports. As a result, WADA considered the Russian Anti-Doping Agency to be non-compliant with the World Anti-Doping Code, and recommended that Russia be banned from competing in the 2016 Summer Olympics. Russia was not banned from the 2016 Olympics by the IOC, the decision that was widely criticized by both athletes and writers; the IOC only required Russia's athletes to be cleared by an internal panel and their respective sports federations. The IAAF had suspended Russia from international track and field events due to the scandal, but did allow Darya Klishina to participate in the Olympics because she was confirmed not to be a part of a doping program. The International Paralympic Committee suspended the Russian Paralympic Committee and banned the team from the 2016 Summer Paralympics. On 5 December 2017, the IOC voted to suspend the Russian Olympic Committee, thus banning it from sending athletes under the Russian flag to the 2018 Winter Olympics. Cleared Russian athletes were allowed to participate as "Olympic Athletes from Russia" (OAR). Two of them, curler Alexander Krushelnitskiy, who won a bronze medal, and bobsledder Nadezhda Sergeeva, failed drug tests during the Games. The IOC's Oswald Commission disqualified and banned 43 Russian athletes, and stripped thirteen medals they earned in Sochi. On 1 February 2018, the Court of Arbitration for Sport (CAS) found that the IOC provided insufficient evidence for 28 athletes, and overturned their IOC sanctions. For 11 other athletes, the CAS decided that there was sufficient evidence to uphold their Sochi sanctions, but reduced their lifetime bans to only the 2018 Winter Olympics. The IOC said in a statement that "the result of the CAS decision does not mean that athletes from the group of 28 will be invited to the [2018 Winter Olympic] Games. Not being sanctioned does not automatically confer the privilege of an invitation” and that “this [case] may have a serious impact on the future fight against doping”. The IOC found it important to note that the CAS Secretary General "insisted that the CAS decision does not mean that these 28 athletes are innocent” and that they would consider an appeal against the court's decision. Later that month, the Russian Olympic Committee was reinstated by the IOC, despite failed doping tests during the 2018 Olympics, and the Russian Anti-Doping Agency was re-certified in September, despite the Russian officials not accepting the McLaren report. ^ "Sochi 2014 Facts & figures" (PDF). International Olympic Committee. 1 February 2015. ^ a b Ruiz, Rebecca; Panja, Tariq. "Russia Banned from Winter Olympics by I.O.C." The New York Times. Retrieved 5 December 2017. ^ a b Hobson, Will (5 December 2017). "Russia banned from 2018 Olympics for widespread doping program". Washington Post. ISSN 0190-8286. Retrieved 5 December 2017. ^ "Sochi Elected as Host City of XXII Olympic Winter Games, International Olympic Committee". Olympic.org. 4 July 2007. Retrieved 17 January 2014. ^ Oliphant, Roland (30 October 2013). "Sochi: chaos behind the scenes of world's most expensive Winter Olympics". Daily Telegraph. London. Retrieved 5 February 2014. ^ Owen Gibson (9 October 2013). "Sochi 2014: the costliest Olympics yet but where has all the money gone?". The Guardian. Retrieved 6 February 2014. ^ Kuzmin, Vladimir (24 May 2012). "Назначенцы-2012" [Appointees 2012]. Rossiyskaya Gazeta (in Russian). The Kremlin in Moscow. Retrieved 4 March 2016. ^ Dawisha, Karen (2014). Putin's Kleptocracy: Who Owns Russia?. Simon & Schuster. pp. 87, 377. ISBN 978-1-4767-9519-5. ^ Sukhov, Oleg (28 March 2014). "From Olympics to Crimea, Putin Loyalist Kozak Entrusted with Kremlin Mega-Projects". The Moscow Times. Retrieved 4 March 2016. ^ a b c d Golubchikov, Oleg (31 January 2017). "From a sports mega-event to a regional mega-project: the Sochi winter Olympics and the return of geography in state development priorities" (PDF). International Journal of Sport Policy and Politics. 0 (2): 237–255. doi:10.1080/19406940.2016.1272620. ISSN 1940-6940. ^ Madler, Mark (24 February 2014). "WET Design Runs Rings Around Rivals". San Fernando Business Journal. Los Angeles, California: California Business Journals. Retrieved 26 February 2014. ^ "Sochi track warms up for Russian F1 Grand Prix". RT. Retrieved 25 November 2014. ^ Korsunskaya, Darya; Gennady Fydorov, Alan Baldwin (14 October 2010). "Sochi to host Russian GP from 2014–2020". Reuters. Retrieved 20 October 2010. ^ "IOC threatens to postpone Russian Grand Prix". GP Update. 13 January 2011. Retrieved 30 April 2012. ^ "Russia to Spend $50 Million Taking Roof Off Sochi Olympic Stadium". The Moscow Times. Retrieved 19 July 2016. ^ "Russia 2018 preparations suffer setback as Sochi Olympic Stadium completion date pushed back". InsideTheGames.biz. Retrieved 19 July 2016. ^ Bing Ads (23 April 2013). "Avaya Official supplyer of network equipment". Slideshare.net. Archived from the original on 2 December 2013. Retrieved 9 December 2013. ^ "US firm Avaya named as Sochi 2014 network equipment supplier". Insidethegames.biz. 30 November 2011. Retrieved 17 January 2014. ^ "Sochi 2014 Olympic Winter Games" (PDF). Avaya. 2013. Archived from the original (PDF) on 13 May 2014. Retrieved 10 December 2013. ^ James Careless (December 2013). "Avaya builds massive Wi-Fi net for 2014 Winter Olympics". Network World. Archived from the original on 16 December 2013. ^ "Инновационное олимпийское телевизионное оборудование впервые в Сочи". Broadcasting.ru. Retrieved 9 December 2013. ^ "'МИР ИТ' приютил олимпийскую ВОЛС". comnews.ru. Retrieved 17 November 2013. ^ ""Ростелеком" обеспечил телекоммуникационными услугами олимпийский медиацентр в Сочи". TASS-TELECOM. Archived from the original on 25 January 2014. Retrieved 23 January 2014. ^ "Olympics' press center and Mountain Cluster's media center open in Sochi". ITAR-TASS. 24 January 2014. Retrieved 24 January 2014. ^ "Sochi welcomes 2014 Winter Olympics with traditional Russian hospitality". En.itar-tass.com. Archived from the original on 24 February 2014. Retrieved 7 February 2014. ^ "Playing in the snow | WAG MAGAZINE ONLINE". Wagmag.com. ^ "Russian Railways President Yakunin sums up investment programme for first 7 months of 2011". Russian Railways. Archived from the original on 24 September 2011. Retrieved 17 August 2011. ^ "Гости Олимпиады смогут отправить написанное пером письмо, оплатив почтовые услуги маркой с собственной фотографией". TASS Telecom. Archived from the original on 9 January 2014. Retrieved 9 January 2014. ^ Lally, Kathy (1 October 2013). "Russia anti-gay law casts a shadow over Sochi's 2014 Olympics". Washington Post. Retrieved 29 September 2013. ^ "Soyuz TMA-09M safely returns crew back to Earth". NASASpaceFlight. Retrieved 4 February 2014. ^ 9. listopadu 2013 17:51. "Kosmonauti si poprvé ve volném vesmíru předali olympijskou pochodeň". Technet.idnes.cz. Retrieved 9 December 2013. ^ Loumena, Dan (23 November 2013). "Sochi Olympic torch takes plunge into world's deepest lake". Los Angeles Times. Associated Press. Retrieved 9 December 2013. ^ Faith Karimi; Michael Martinez (7 February 2014). "Sochi 2014 begins with teams, classical music and a flying girl". CNN. Retrieved 7 February 2014. ^ Kathy Lally; Will Englund (7 February 2014). "Olympics open in Sochi with extravagant pageant". Washington Post. Retrieved 8 February 2014. ^ "News". sochi2014.com. Retrieved 10 February 2014. ^ "Vladislav Tretyak and Irina Rodnina lit the Olympic flame at the Fisht Stadium in Sochi". Archived from the original on 31 March 2014. Retrieved 4 March 2014. ^ "Record 88 nations to participate in Winter Games". Global News. 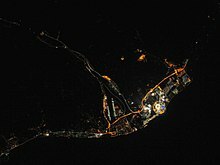 Sochi, Russia. Associated Press. 2 February 2014. Retrieved 2 February 2014. ^ MacKenzie, Eric (16 January 2014). "Sochi Spotlight: Zimbabwe's first Winter Olympian". Pique Newsmagazine. Whistler, British Columbia, Canada. Retrieved 16 January 2014. ^ Pagan Rivera, Esteban (12 January 2014). "Kristina Krone: Quería ir a Sochi, pero nunca recibió contestación del Comité Olímpico". Primerahora (in Spanish). Retrieved 12 January 2014. ^ "Sascoc crush Speelman's Olympic dream". IOL Sport. 23 January 2014. Retrieved 24 January 2014. ^ Dubault, Fabrice (24 January 2014). "L'histoire invraisemblable de Mehdi Khelifi privé de J.O par l'Algérie". France 3. Retrieved 24 January 2014. ^ "Sochi Games: Four Indian skiers to go as independent athletes". Zee news. 31 December 2013. Retrieved 31 December 2013. ^ "IOC Executive Board lifts suspension of NOC of India". Retrieved 11 February 2014. ^ "National Olympic Houses". tripadvisor. Retrieved 24 January 2014. ^ a b c d "Olympic Parc; Hospitality Houses". sochi2014.com. Retrieved 24 January 2014. ^ "Opening Canada House" (in Dutch). CBC. 6 February 2014. Retrieved 7 February 2014. ^ "China House opens in Sochi". XinHua Net. 7 February 2014. Retrieved 10 February 2014. ^ "Zeman slavnostně otevřel Český dům a pravil: Budu váš maskot" (in Czech). Lidové noviny. 8 February 2014. Retrieved 8 February 2014. ^ "Dossier de presse Sotchi 201" (PDF) (in French). Esprit Bleu France Olympic. 28 January 2014. Retrieved 28 January 2014. ^ "Deutsches Haus Sotschi 2014 in Russlands Bergen". DOSB. 25 April 2013. Archived from the original on 20 February 2014. Retrieved 3 February 2014. ^ 5 min fa. "Sochi, la Gazzetta entra a Casa Italia: tra cantieri, optional e sobrietà – La Gazzetta dello Sport". Gazzetta.it. Retrieved 8 February 2014. ^ lsm.lv. "Linda Leen nozog hokejistu sirdis". Retrieved 10 February 2014. ^ "Holland Heineken House dichter bij olympiërs dan ooit" (in Dutch). nusport.nl. 13 January 2014. Retrieved 24 January 2014. ^ "Slovak athletes set for Sochi". The Slovak Spectator. 3 February 2014. Retrieved 7 February 2014. ^ "USOC plans USA House sites in Sochi, at home". sportsbusinessdaily.com. 21 October 2013. Retrieved 24 January 2014. ^ "Discover the twelve new winter sports events for Sochi 2014!". Olympic.org. 18 December 2013. Retrieved 4 February 2014. ^ a b "Rogge announces three new disciplines for Sochi 2014". Russia Today. TV-Novosti. 5 July 2011. Retrieved 6 July 2011. ^ "Women's ski jumping gets 2014 Sochi Olympics go-ahead". Bbc.co.uk. 6 April 2011. Retrieved 19 February 2014. ^ Thompson, Anna (5 July 2011). "Slopestyle given Sochi 2014 Winter Olympics go-ahead". Bbc.co.uk. Retrieved 19 February 2014. ^ "FIS Congress 2010 Decisions". FIS-Ski. Archived from the original on 10 June 2010. Retrieved 23 March 2011. ^ "Russian ice hockey will be skating in Sochi". Infox.ru. AktivMedia. 7 June 2010. Retrieved 23 March 2011. ^ "No time to relax! The show must go on...again!". Eastbourneherald.co.uk. 10 March 2010. Retrieved 19 February 2014. 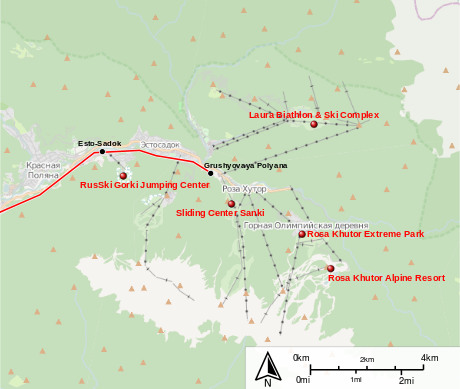 ^ "No Olympics for Ski Mountaineering". The Mountain World. Retrieved 2 April 2012. ^ "No inclusion of ski orienteering in the IOC review process for 2014". International Orienteering Federation. Retrieved 2 April 2012. ^ a b "Olympic Programme Updates". Olympic.org. International Olympic Committee. 28 November 2006. Archived from the original on 15 September 2008. Retrieved 20 August 2008. ^ "Sochi 2014 Closing Ceremony Unites Olympic Generations". Sochi 2014. 23 February 2014. Retrieved 24 February 2014. ^ "Sochi 2014 Unveils Olympic Medals". Olympic.org. Retrieved 4 February 2014. ^ "Winners at Sochi Winter Olympics to receive pieces of Russia meteorite". London: The Telegraph. 26 July 2013. Retrieved 28 July 2013. ^ "Russian Police to Speak 3 Languages at Sochi Olympics – Ministry". RIA Novosti. Archived from the original on 10 December 2013. Retrieved 6 December 2013. ^ "Russian Military to Ensure Security at 2014 Olympics". RIA Novosti. Retrieved 6 December 2013. ^ a b "Sochi Olympic Protests to Require Approval from Russia's Security Service". RIA Novosti. Archived from the original on 10 December 2013. Retrieved 6 December 2013. ^ Oliphant, Roland; Lundy, Jack (2 February 2014). "Sochi Olympic organisers face accommodation crisis". The Daily Telegraph. London. Retrieved 2 February 2014. ^ Oliphant, Roland (5 February 2014). "The shambles behind the scenes at Sochi". The Daily Telegraph. London. Retrieved 5 February 2014. ^ "Russia takes unprecedented security measures ahead of Sochi Olympics". ITAR TASS. Retrieved 11 January 2014. ^ "Space monitoring systems of emergency situations deployed in Sochi". ITAR TASS. Retrieved 9 January 2014. ^ "Russian emergencies minister praises Sochi security system". ITAR TASS. 27 January 2014. Archived from the original on 4 February 2014. Retrieved 27 January 2014. ^ "Internal Troops to provide security at Sochi Olympics". Russia Beyond the Headlines. 15 January 2014. Retrieved 16 January 2014. ^ "Siberia joins national effort to make the Sochi Olympics safe and successful". Siberia Times. 16 January 2014. Retrieved 16 January 2014. ^ "Sochi Drafts In Cossacks for Olympic Security". RIA Novosti. Retrieved 9 January 2014. ^ "Some 300 Cossacks to Help Police Sochi Olympics". RIA Novosti. Retrieved 9 January 2014. ^ a b "Olympic Teams Prepare for Possible Security Crisis in Sochi". The Moscow Times. 22 January 2014. Retrieved 23 January 2014. ^ "Obama offers US security assistance to Putin as Olympic terror fears mount". Fox News. 22 January 2014. Retrieved 4 February 2014. ^ "As Sochi Olympic venues are built, so are Kremlin's surveillance networks". The Guardian. 6 October 2013. ^ Walker, Shaun (6 October 2013). "Russia to monitor 'all communications' at Winter Olympics in Sochi". The Guardian. ISSN 0261-3077. Retrieved 14 April 2016. ^ "Caucasus Emirate Leader Calls On Insurgents To Thwart Sochi Winter Olympics". Radio Free Europe/Radio Liberty. Retrieved 13 February 2014. ^ Rumsby, Ben (22 January 2014). "Winter Olympics 2014: email threat to 'blow up' athletes at Sochi Games dismissed by IOC". Telegraph. London. Retrieved 30 January 2014. ^ "European Olympic Committees Report Sochi Terror Threats". En.ria.ru. 22 January 2014. Retrieved 7 February 2014. ^ Love, Tom (3 September 2012). "Sportfive concludes Olympic agreement in Russia". SportsPro. Retrieved 4 September 2012. ^ "Lazarus: We Believe Sochi Olympics Will Be Profitable". Broadcasting & Cable. Retrieved 13 August 2013. ^ "Sportsnet to air 200 hours of Sochi Games". Sportsnet. Archived from the original on 13 February 2013. Retrieved 8 February 2013. ^ Pennington, Adrian. "Comcast to Produce Olympics 2014 in Ultra HD". The Hollywood Reporter. Retrieved 27 January 2014. ^ "Russia to transmit 4K from Sochi". TVBEurope. NewBay Media. Archived from the original on 27 January 2014. Retrieved 27 January 2014. ^ "Putin cancels New Year holidays for officials responsible for Winter Games". ITAR-TASS. Retrieved 30 November 2013. ^ Pennington, Adrian (4 February 2014). "Sochi Games to Set Record for Live and VOD Streaming". Streaming Media Europe. Retrieved 8 February 2014. ^ "Judge bans Sochi 2014 gay Pride House claiming it would offend "public morality"". Inside the Games. Retrieved 12 February 2014. ^ Johnson, Ted (24 July 2013). "Russia's Anti-Gay Laws Present Challenge for NBC's Olympics Coverage". Variety. Retrieved 25 July 2013. ^ Fierstein, Harvey (21 July 2013). "Russia's Anti-Gay Crackdown". The New York Times. Retrieved 25 July 2013. ^ Herszenhorn, David M. (11 August 2013). "Gays in Russia Find No Haven, Despite Support From the West". The New York Times. Retrieved 10 February 2014. ^ Skybenko, Ella (7 February 2014). "Companies can help advance human rights; Sochi shows they rarely use it". The Guardian. Retrieved 8 February 2014. ^ Bennetts, Marc (19 January 2014). "Winter Olympics 2014: Sochi Games "nothing but a monstrous scam," says Kremlin critic Boris Nemtsov". Telegraph. London. Retrieved 4 February 2014. ^ "The Sochi Olympics: Castles in the sand". The Economist. 13 July 2013. Retrieved 8 August 2013. ^ Encyclopædia Britannica entry for Circassians: "From ancient times Circassia, comprising roughly the northwestern region of the Caucasus, acquired the exotic reputation common to lands occupying a crucial area between rival empires..."
^ "145th Anniversary of the Circassian Genocide and the Sochi Olympics Issue". Reuters. 22 May 2009. Archived from the original on 2 July 2012. Retrieved 28 November 2009. ^ Ellen Barry (20 May 2011). "Georgia Says Russia Committed Genocide in 19th Century". The New York Times. ^ Andrea Alexander (9 February 2010). "North Jersey Circassians 'in exile' launch Olympic protest". The Record. Archived from the original on 21 February 2014. Retrieved 13 February 2014. ^ Gabriele Barbati (6 February 2014). "Circassians Protest Winter Olympics Being Held At Sochi Genocide Site". International Business Times. Retrieved 10 February 2014. 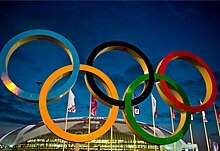 ^ "Olympics-IOC says Russia-Georgia conflict "a sad reality"". Reuters. 9 August 2008. ^ Azamat Bram. Circassians Voice Olympian Anger. Institute for War and Peace Reporting Caucasus Reporting Service No. 413, 5 October 2007. Retrieved on 2 April 2010. ^ Farhi, Paul (21 February 2014). "In coverage of Olympics, NBC has largely steered clear of controversy". The New York Times. Retrieved 25 February 2014. ^ a b Ruiz, Rebecca R.; Schwirtz, Michael (13 May 2016). "Mystery in Sochi Doping Case Lies With Tamper-Proof Bottle". The New York Times. Retrieved 14 May 2016. ^ "Russian athletics: IAAF upholds ban before Rio Olympics". The Guardian. Retrieved 21 July 2016. ^ "Takeaways from McLaren report? Confusion, corruption, cynicism". ESPN.com. 18 July 2016. Retrieved 3 October 2018. ^ Ruiz, Rebecca R. (27 December 2016). "Russians No Longer Dispute Olympic Doping Operation". The New York Times. ^ "McLaren Independent Investigations Report into Sochi Allegations". WADA. 18 July 2016. ^ "WADA Statement: Independent Investigation confirms Russian State manipulation of the doping control process". WADA. ^ Stubbs, Jack (15 August 2016). "Exclusive: Russia's Klishina to compete after appeal upheld". Reuters. ^ Ingle, Sean (1 February 2018). "IOC dismayed after doping bans on 28 Russian athletes overturned by Cas". the Guardian. Retrieved 3 October 2018. "Results and Medalists — 2014 Winter Olympics". Olympic.org. International Olympic Committee.